Arabascato Marble is a Natural material. Arabascato Marble is a Low priced Marble stone. Arbascato Marble is a very pure looking white material with grey running through it. It is normally more expensive compared to Carrara marbles. It will look stunning in any kitchen as a centre piece island and will also finish off bathrooms as flooring or shower cladding and shower trays. This material is softer and will take more looking after if in a kitchen environment. If you like this look but a little worried about looking after it, then please ask one of are staff to view the man-made materials we have to offer. An alternative that is becoming increasingly popular is Quartz. Arabascato Marble is a Natural Marble from Brazil, Landford Stone offer this type of stone in a variety of thicknesses and finishes. 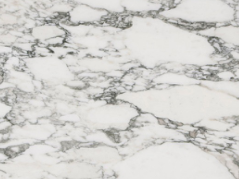 Arabascato Marble is a Low priced stone and will look incredible in your home!